Looking for Night missions for Area 3? Click [Here]. Now enemy units’ strength gets higher in this Area. Make sure your squad’s strength is high enough to prevent wasting precious bullets and food especially during time of special events. While there’s one squad method of S-Rank clear, there are lot of variables that could either make it harder or impossible due to randomness. So I will be sticking to 2 squad method of S-Rank clear to be bit more reliable. 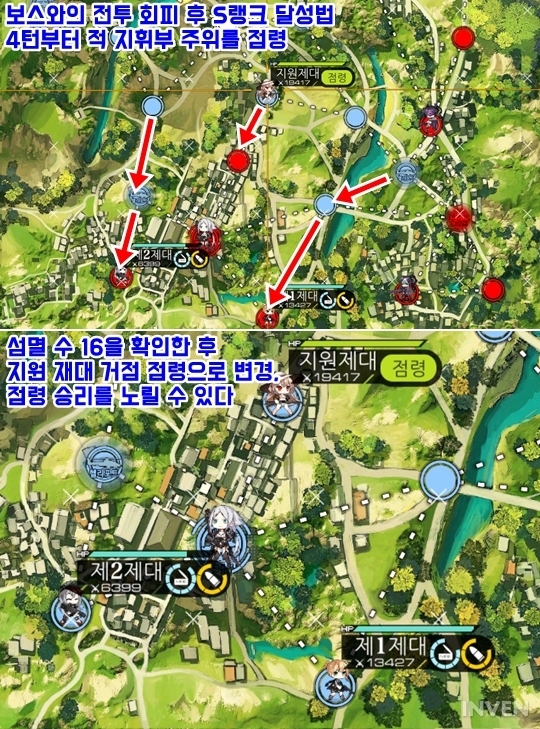 Strongly recommend having 2 squads of least 4 links T-dolls for such task to prevent any resource waste and multiple tries but it could be done at lower level with sufficient micro. I have listed MINIMUM strength recommendation on each stage. Starting from this area a Dummy unit will be used frequently to secure more movement points. What is a dummy unit? Dummy unit is a squad with one handgun with one link that will not be in any battle. This gives 2 main squad an additional movement point while minimizing the human resource expenditure. Some of the pictures can be bit small for the view but it’s pretty close to original image. If you use both Friend’s Squad [or Griffin] and dummy squad effectively, full S-Rank clear will be easier than you think. S-Rank condition: Kill 6 unit in 4 turns; control enemy HQ. Turn 2: Deploy 2nd squad on HQ. Turn 3~4: Meet kill requirements then occupy enemy HQ. Start by deploying 1st Squad on the Right helipad and 2nd on HQ. Turn 3~4: Meet kill requirement then occupy enemy HQ. 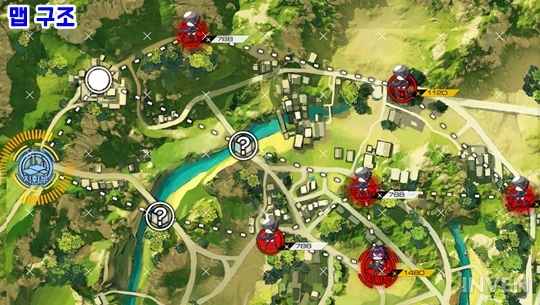 This map you start with 2nd Squad [lower strength] deployed first. Turn 1: Deploy 1st squad after moving 2nd squad down one. S-Rank condition: Kill 6 unit in 3 turns; control enemy HQ. Turn 1: Deploy 2nd Squad after moving 1st Squad right one. Turn 3: Meet kill requirements then occupy enemy HQ. S-Rank condition: Kill 9 unit in 4 turns; control enemy HQ. Kill numbers are starting to escalate quickly. If your unit is having hard time maintaining strength and links, it is better to come back later. Deploy 1st Squad on HQ and 2nd Squad on Helipad. Turn 2: Beginning of the turn, deploy Friend’s unit on HQ and swap position with 2nd Squad on the right (#5~6). Move 2nd Squad down one and use 1st Squad to occupy enemy HQ. S-Rank condition: Kill 16 unit in 6 turns; control enemy HQ. *It gets little bit complicated so pay attention to numbers. Start with 1st Squad on HQ and 2nd Squad on Far left helipad. Turn 1: At the start of your turn, deploy Friend’s Squad in the helipad on the middle. Move 1st Squad according to number [1~4]. Swap with Friend’s Squad , resupply , then swap back down with Friend’s Squad . Move 2nd Squad . Turn 2: Swap once more with Friend’s squad , follow numbers [10 & 11], swap again , then occupy helipad . Move down 2nd Squad one . Turn 4: Kill enemy reinforcement units coming out of helipad to fill 16 kill requirements then occupy enemy HQ. Start with 2nd Squad on HQ. Turn 1: Deploy 1st Squad on HQ after moving 2nd Squad down one. Turn 3: Meet 6 kill requirement then occupy enemy HQ. turn 3: Meet 6 kill requirement before occupying enemy HQ. Deploy 1st Squad on HQ and 2nd Squad on Helipad. Turn 3~4: Meet 9 kill requirement then occupy enemy HQ. Deploy 1st Squad on HQ, 2nd Squad on the Left helipad, and dummy Squad on the center helipad. Turn 1: Use dummy squad to swap with 1st Squad to resupply and swap again to bottom. [It’s exactly same as 3-6 except you are not using friend’s Squad]. Turn 5~6: Kill enemy reinforcement to fill 16 kill requirement and either kill the boss or surround auto occupy HQ to get S-Rank.